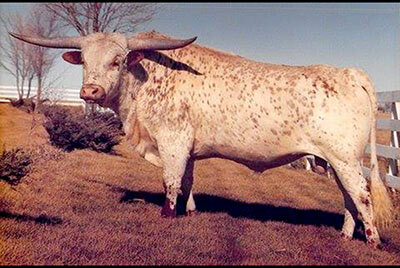 Classic Celebrity ~~ The famous early foundation cow Measles was bred to Texas Ranger JP 8 times. Of the three TR daughters, "Cheetah" was bred to Don Quixote and produced Quixote Cheetah. She was bred to Classic and produced the colorful chocolate speckled $110,000 bull Rural Delivery and a lesser known son with more horn named Classic Celebrity. Although Classic Celebrity was a full brother to the highest priced son of Classic, his less desirable color left him in an unpopular second place. This photo was taken on the lawn of the DCCI Embryo Facility in 1984 when CC was a 3 year old. We turned him loose in the front yard and walked him around on the lawn until he struck a pose. Famous heart surgeon, Dr. Joe Graham purchased CC and used him at the Mi Tierra Ranch near Joplin, MO. Classic Celebrity sired Starlight Celebration, the dam of Zech Dameron III's famous clone cow Starlight. Thanks to Starlight not only were a bunch of beautiful clones produced, but also Awesome Viagra, Slick's Little Star, Starliner and then Tejas Star and many more. If anyone wonders where Starlight got her color, this is the way it works.